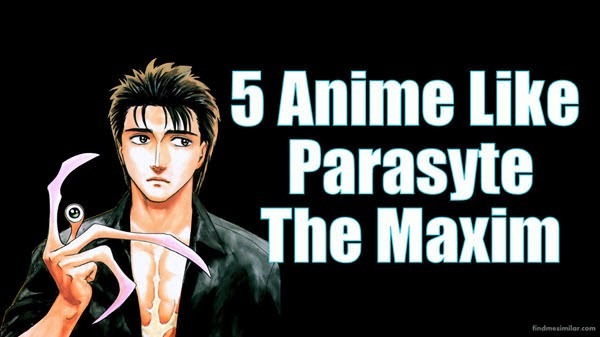 6 Best Anime Like Parasyte / Kiseijuu '+g+"
Parasyte: The Maxim (aka Kiseijuu: Sei no kakuritsu) is a japanese sci-fi anime that follows the story of Shinichi, the protagonist in this anime. Shinichi is an 17-year-old compassionate high-school student infected with a parasyte called Migi which has taken over his right hand. Now he must try to coexist peacefully with Migi without being killed by other parasytes or becoming a lab specimen for humans. The anime has very good character development of Shinichi from an average wimpy kind of boy to a well balanced, calm and muscular teen. As the series is has been completed and if you are looking for more similar anime like Parasyte, then check out the 5 anime below that have some similarities to Parasyte in their own unique way. Kaneki ken a normal boy meets Rize Kamishiro a beautiful girl he loves but his life completely changes after knowing she was an flesh eating creature with an hunger for human flesh simply called as "ghoul". After his narrow escape from being her meals as she is killed in an accident doctors take drastic measures to save Kaneki by transplant him with Rize's organs in order to save him. Now Kaneki has become an half-ghoul with a consciousness of human and hunger of a ghoul. Like Parasyte the protagonist of Tokyo Ghoul is a normal teen whose life suddenly changes making them a killing machine against the unknown in order to survive. Ajin Shares a lot of similarities like Parasyte, Here the main character Kei Nagai meets with an accident only to discover he is an "Ajin". Ajin are demi humans with amazing regenerative abilities that cannot die. In a world where Ajin are considered extremely dangerous Kei is now on a run from society, government and other Ajin's. Gantz is a dark sci-fi anime with heavy dose of violence and sexual content where the unlucky dead people are brought back to life and forced to play a game by hunting and killing aliens with the prize of getting their life back. It may not be similar with Parasyte in terms of story but the plot and theme of Gantz have some similarities. The Diclonius are mutated humans with horns and telekinetic abilities. All of these Diclonii are captured and experimented in a secret government facility where Lucy one of the psychotic Diclonius escapes the facility and wreaks havoc. During the process of escaping an injury caused her to lose her memory and falls into the ocean. Kouta and Yuka two locals cousins finds and provides her with shelter not knowing who she really was. Elfen Lied has many similarities with Parasyte but with an extra dose of gore and violence. In a Dystopian future where all the people are scanned for their criminal tendencies called Psycho-Pass Akane Tsunemori is been tasked to control the crime by catching the people with high Psycho-Pass levels using the help of Enforcers. Pupa is a horror anime that follows an orphaned brother and sister (Utsutsu and Yume Hasegawa) who gets infected by a virus known as "pupa" after seeing red butterflies. The virus mutates in the hosts body and turns them into monsters that live on human flesh. The virus has different effects on both. Utsutsu must now find a drug to suppress the virus in Yume. Like Parasyte Pupa also has a dark theme with many similarities in the story. Before watching this beware Pupa is not recommended for the faint-hearted. If you are looking for more anime similar to Parasyte / Kiseijuu you can check out Another, Attack on Titan, Speed Grapher, Vampire Hunter D: Bloodlust, Claymore, Death Note, Terra Formars and Deadman Wonderland. All of these anime have some similarities like Parasyte in their own way. If you think of more anime like Parasyte: The Maxim (Kiseijuu: Sei no kakuritsu) don't forget to mention them in the comments below.